Lord have mercy! Can I get a witness? 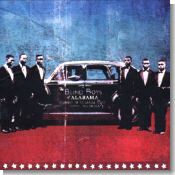 Even if you're not a fan of spiritual music, this current release from The Blind Boys Of Alabama, Spirit Of The Century (Real World), may very well convert you. In addition, you will jump, shout and sing along with this collection of traditional spirituals presented as an intelligently conceived hybrid of gospel and its offspring, the blues. Not to be confused with their arch rivals, The Blind Boys Of Mississippi, this group came together in 1939 at the Talladega Institute For The Blind, and still contains two original members! That would make this their eighth decade of making music together, if I am not mistaken. How's that for longevity, eh? The number of the members in this group has varied over the years between four and six. The current lineup is Clarence Fountain, Jimmy Carter, George Scott and Joey Williams. Founding member Clarence Fountain is considered the leader and main voice of the group, but on Spirit Of The Century you will find the lead vocals shared among other members when they aren't harmonizing together. I said before that this was an album of traditional spirituals. But there are a few exceptions of the 12 selections starting with the very moving opening number, "Jesus Gonna Be Here," featuring Clarence Fountain on lead vocals. Along with "Way Down In The Hole," this number was penned by Tom Waits (yes, you read it correctly). The members of the group informed producer John Chelew that they had to understand the message behind those two pieces, in addition to Ben Harper's "Give A Man A Home," before recording them, as they were not robots. The irony is that these three numbers outshine the rest. The other eight tunes are traditional gospel pieces given magnificent arrangements by producer Chelew and the stellar band of musicians assembled for these sessions. John Hammond is on hand on electric guitar and dobro. The classy, just perfect harmonica lines you will hear are courtesy of Charlie Musselwhite. The searing electric slide is contributed by session veteran David Lindley, who, when asked how much he wanted to be paid for his work on this album, said, "I should be paying you guys to work on this project." The rhythm section comes from Richard Thompson's band in the form of Danny Thompson playing a wicked double bass and Michael Jerome on drums. "Run On For A Long Time" has George Scott on lead vocals, and a slight flavor of rap/hip hop undertone to it along with some beautiful harmonizing by all four. John Hammond's dobro is the only instrument to be heard on "Good Religion," and even that really wasn't a necessity considering the powerful performances turned in vocally. The tune most familiar to everyone on this album, "Amazing Grace," is given an unusual treatment that has it sounding like it's been crossed with "House Of The Rising Son." As strange as it sounds it works big time, and is followed by a 'blow the roof off the revival tent' rendition of "Soldier." A beautifully arranged version of "Motherless Child" may cause a big ole lump in your throat if you aren't careful, so eating while listening to this piece is not recommended. There is one other track that is not a traditional gospel tune. A number from Mick Jagger and Keith Richards, "Just Want To See His Face," stands a good chance of becoming one though. "The Last Time" closes this fantastic recording with the lone a cappella performance on the album, and I'll let it speak for itself. I'll personally be looking forward to this group's next release with much anticipation. If you know anyone that has said that they don't care for gospel music, play them this album and have fun watching their opinion change in the space of about the first four tracks. Call it a gospel album or call it a blues album or call it a crossover album if you will. But whatever you call it, I'm sure it will be preceded by the words great, incredible, fantastic or .... oh hell, I think you get the picture. Lay your hands on a copy of this gem as soon as you can. You won't be sorry.